In this digital era, data is one of the most important asset to everyone. With something so important there comes a responsibility of keeping our assets safe. We can always make copies of data i.e. backups in case we lost the original copy due to some issue. But backing up data can be one of the most boring job without the proper tools and knowledge. So today we will do EaseUS Todo backup review which has many different backup options according to our needs. Do note that we are using EaseUS Todo backup Home edition which is a paid version. To start with we will list all the features of EaseUS Todo Backup which is a free backup software. Then we will see how you can use these features for your benefit. Along with these features it also has some tools like checking image integrity, create emergency disk, wipe data, mount/unmount disk etc. Now this will create the backup of the entire disk or the partition which you choose manually. There is more to it, you can also schedule backups to happen automatically at a certain period of time. After you select the drive/partition to backup and the destination, its time for the backup options. 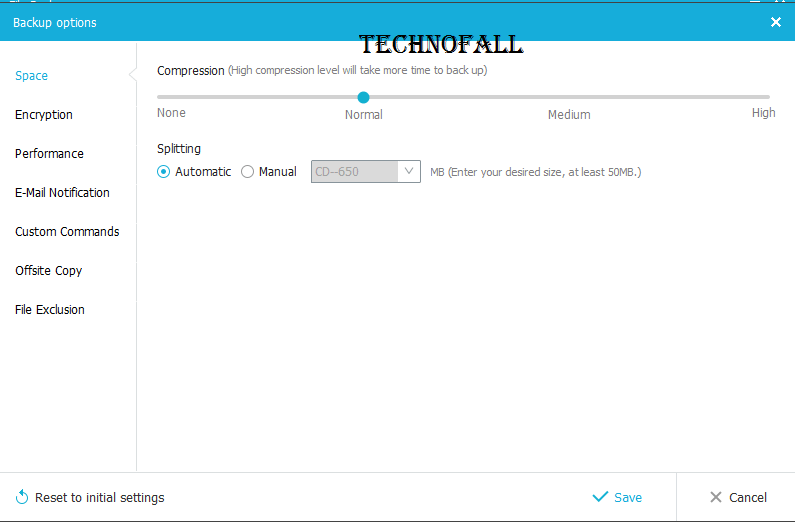 First backup option enables you to choose the compression ranging from none to high. Higher the compression rate slower the backup operations will be. You can also split the backup in different images either automatically or manually. The second option is encrypion which will let you to choose a password for the backup so that no one can misuse your data even if they have the file. The third option is performance which lets you decide how much system resource should the software use for these operations. If you choose high, the backup will be faster but your system will get slower and you can’t multi-task. You can also choose the network transfer speed if the destination or source is present in some other machine on the network. Email notifiaction is the next option which will notify you of the activities of this software. You can also set commands before or after the backup to happen automatically like to shut down the system after backing up all the data. Again the destination/source can be some server in which case you can turn on the FTP transfer which is the next feature. You can also exclude certain files that you don’t want to include in the backup. So these were some amazing backup options which gives you freedom of all sorts. I tried backing up around 8 GB of data and the backup image was of 5 GB that means 3GB compression even at normal compression rate. After that you can always do a incremental or differential backup that will save time. This option must be chosen when we have to backup certain files or folders periodically or once in a while. Suppose you have a work folder in you local machine which you need to backup in your USB drive everyday when you leave office. Then you can either schedule the backup or do it manually using this option. It also has the same backup options mentioned above. Now this is associated with the operating system installed on your machine like mine is running Windows 10 present in C drive. Normally if you copy all the C drive files and paste it in some other computer, it will not boot up like your normal PC would, because these system files need to be present in the proper sectors. This all is done easily with EaseUS Todo backup utility. You just need to choose this option and it will auto detect the type of system you are running and the rest is similar to the aforementioned steps. The next options is smart backup which will automatically backup any new files that you create while this service is already running. You can turn on monitoring for changes in certain locations and it will backup files only from the source that you mentioned earlier. Mail backup means backing up all the emails present in the email client that you use like Outlook. You can take backup of all the folders and then may be go ahead with deleting certain emails without the worry of losing them permanently. You have the option to choose which all emails accounts you want to backup. The mail backup option also saves the sync hassle that is performed when you sign in the outlook account after a fresh system install. Cloning a hard drive involves copying data from one disk to another one creating a perfect clone of each other. This option can also be used on C drive where normally our system resides. If you plan to upgrade your hard drive you can clone the previous disk into the new one. 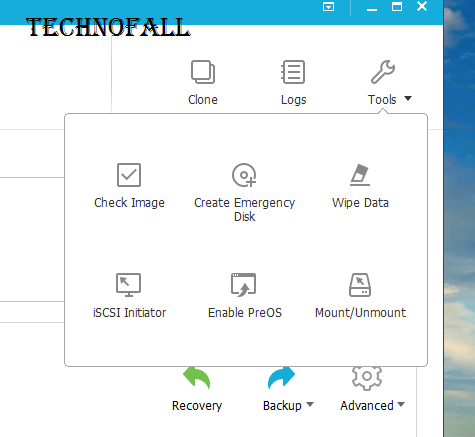 You also have an option to optimize the backup for SSD and to copy the data sector by sector. The first option is to check the integrity of a backup image which was previously created. This simply means we are checking the image for any data corruption that may be caused by some outside entity. Next tool enable us to create emergency disk which can be helpful if we are not able to boot in the system on any disk. You can take the emergency disk ISO file in any USB drive or CD/DVD. Next option enables us to completely wipe data from any partition so that it cannot be easily recovered. Consider a case where you are not able to boot into the system so how would you recover from any image. So the next option is to enable PreOS which will let you boot into an environment which will help you to restore the system from a backup image. So always keep this option enabled. The last option is to mount/unmount a backup image so that you can browse all the files that are present in the backup. 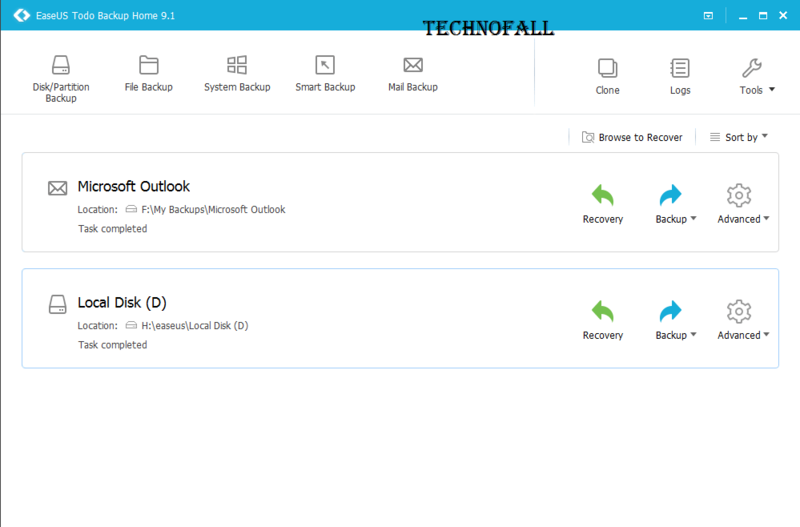 So this was EaseUS Todo backup review and all the things that you can do with this software. To restore data from any backup image you need to just browse for the backup and then restore to the desired location. If you have any doubts related to this utility drop them in the comment section below. ← Should you buy ASUS Zenfone Max?